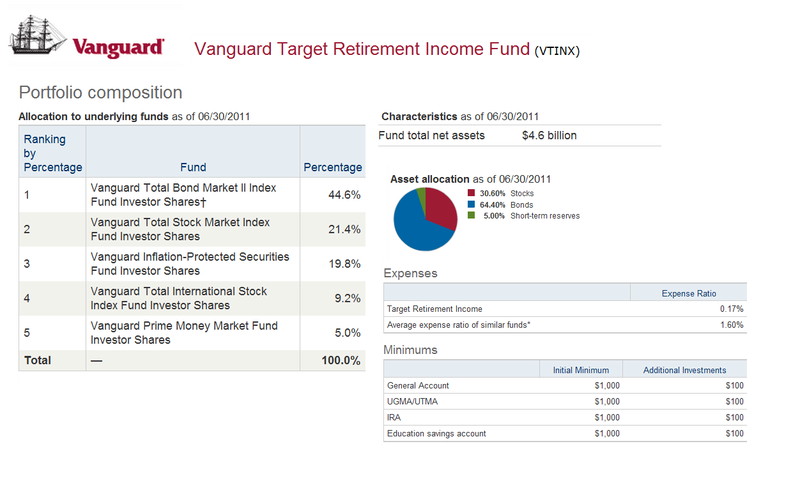 This article will provide fund review of Vanguard Target Retirement Income. This low cost Vanguard fund is among the best retirement income mutual funds. I'll provide the details such as dividend yield, top 10 holdings, total assets, and more. Details about this fund can be found below. The Vanguard Target Retirement Income fund is seeking current income and some capital appreciation. This Vanguard fund invests in other Vanguard mutual funds according to an asset allocation strategy designed for investors currently in retirement. Its expected asset allocation among the underlying funds is as follows: Vanguard Total Bond Market II Index Fund (45%); Vanguard Total Stock Market Index Fund (21%); Vanguard Inflation-Protected Securities Fund (20%); Vanguard Total International Stock Index Fund (9%); and Vanguard Prime Money Market Fund (5%). More details about the fund asset allocations can be found in the fund’s prospectus. Majority of assets are invested in fixed income funds or bond funds, and the rests are invested in stock funds or equity funds. Since its inception in October 2003, Duane F. Kelly has been the lead fund's manager of this Vanguard fund. Since it is a fund of funds, it has 0.0% annual expense ratio. The funds in this Vanguard Target Retirement Income fund do charge expense fee though. As part of no load fund, it doesn’t have any sales load fee. Fund's principal investment risk can be found in the fund's prospectus. The fund total net assets are $4.64 billion. This top retirement income fund has returned 12.36% over the past year and 6.08% over the past 5 years. It receives 4-stars rating from Morningstar and currently has 4.44% YTD return. The S&P research also gave 4 stars ratings for this Vanguard fund. Thestreet.com also rated this fund with ‘Buy’ recommendation (B+). The best 1-year total return so far was achieved in 2009 with 14.28% and the worst one was in 2008 with -10.93%. Investor will need to provide $1,000 min initial investment for brokerage account and IRA account. The minimum subsequent investment for both accounts type is $100. There are 73 brokerages offered this Vanguard fund, such as JP Morgan, LPL SAM Eligible, T Rowe Price, Fidelity Retail Funds Network, DATALynx, Ameriprise Brokerage, Vanguard NTF, Raymond James, Firstrade, Bear Stearns, etc. The best way to invest in Vanguard funds is by opening Vanguard Brokerage Service (VBS) account. The portfolio compositions of this best fund as of June 2011 are Vanguard Total Bond Market II Index Fund Investor Shares (VBMFX), Vanguard Total Stock Market Index Fund Investor Shares (VTSMX), Vanguard Inflation-Protected Securities Fund Investor Shares (VIPSX), Vanguard Total International Shares Index Investor Shares (VGTSX), and Vanguard Prime Money Market Fund Investor Shares (VMMXX). The assets allocation of this best Vanguard fund as of June 2011 is as follow 64.40% in bonds, 30.60% in stocks and 5.0% in short-term. The benchmarks are Target Retirement Income Composite Index and Dow Jones U.S. Total Stock Market Index.